Kiwa are Markku Louhio (Mark Nomen) and Matti Elsinen (DJ Mauzer), an electronic music live act & DJ duo from Finland. Started out as a psychedelic trance project in 1995 they soon made a name for themselves playing in underground raves and forest parties. Since then the sound of Kiwa has grown into a punchy mix of dancefloor electro and breaks. 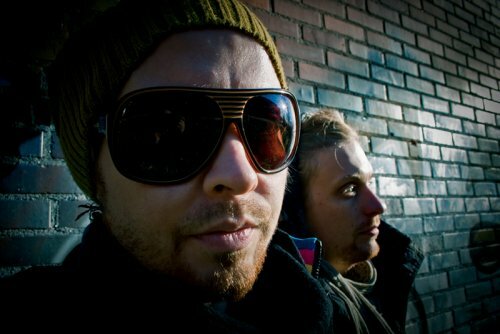 Their music has influences among other styles from tech funk, house and drum 'n' bass with it's driving funky rhythms, rough basslines and epic movie score moments. Since 2002 Kiwa has toured on live and DJ gigs around the world from Brazil to Israel and from Russia to Western Europe. Kiwa's live setup consists of two synchronized laptops, keyboards, controllers and loads of samples and audio channels by which they build their energetic performances on. As the driving force behind the unique sound of Kiwa, Markku has produced numerous albums and acclaimed releases such as Headphonics's 'Evolution Of Funk' opuses 1 & 2 and Highpersonic Whomen's 'Push The Limit', which received 5 out of 5 stars in DJ Mag's review in 2007. He has released his music on labels such as Ministry Of Sound, Funkatech Records, High Grade Recordings, Bombtraxx Records, Digital Structures and Tribal Vision to name a few. After working some years as Headphonics, Markku decided to turn his full attention back to Kiwa, taking his breaks sound, electro beats and massive basslines back to it's roots. His first breaks single as Kiwa - 'Drop Control' dominated the Beatport Top 100 breaks chart as #1 for 3 weeks. Being one of the best selling breaks tunes of 2009, the single was nominated in the Beatport Top 10 chart of hottest breaks tracks that year alongside with artists like Plump DJ's, Fatboy Slim, NAPT and Far Too Loud. Markku has also built a good name for himself as an on-demand remix artist and a mastering engineer. Kiwa is currently busy creating new tunes and remixes for your pleasure. Stay tuned, more to come!